The brushfire burning near Possum Kingdom Lake has now burned more than 6,600 acres and is 60 percent contained, the Texas Forest Service said Saturday. The 101 Ranch fire is burning along the south side of the lake near the town of Brad. Three 1,500-gallon CL-215s were brought in from Canada and made good progress on the fire Friday. The planes are able to take of and land on the water. While on the lake, they pull in water that will be dumped on wildfires. The CL-215s aren't the only air support firefighters on the ground have. National Guard Blackhawk and Chinook helicopters also are assisting and have dropped several hundred thousand gallons of water on the fire the past few days. 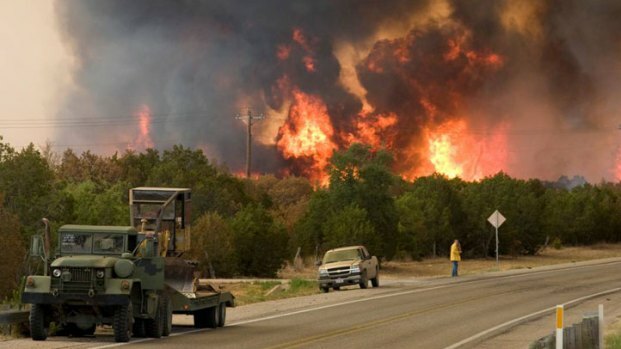 Also, nine strike teams of Texas Intrastate Fire Mutual Aid System engines are assisting. In all, 40 buildings, including homes, and nine RVs have been reported destroyed; 199 saved.